Design the pool you’ve been dreaming of. North Star Pools uses the latest software to design your pool and surrounding landscape. All custom pool projects, pool construction projects and pool remodeling projects begin with pool design. Landscaping also starts with design. This is performed by a graphic designer using state-of-the-art software for designing poolscapes and landscapes. We start with an initial consultation to get an idea of what your dream pool might be and what features you would like to be included. The design is created within a couple of hours based on the initial consultation and if any revisions are needed, they’re done in the digital design before construction even begins. This saves money for you as the pool owner since changes in designs can be costly if they occur after construction has started. The software can be used to create a design from scratch or we can use you’re existing landscape which is converted from photographs and incorporated into the design. 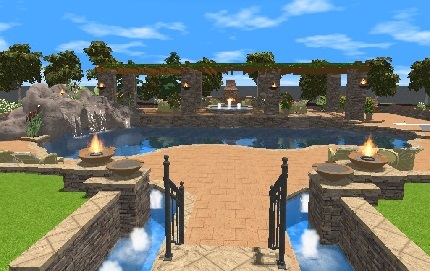 If you’ve ever played video games (or seen your children or grandchildren play them), you’ll find that your completed 3D pool design is similar to a first-person shooter game or role-playing game. Digitally you can “walk” through the entire design, seeing every feature from every angle. Once the design is finished, the next phase is pool construction. The software has some template features which you can use for quick design. Add decking, rock structures, slides, diving board, basketball hoop, volleyball net, lighting, water features and/or fire features. (By the way, fire features look amazing when glowing over the water at night). 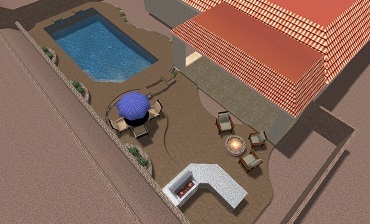 The software is also capable of creating complete landscapes which could include a BBQ, fire pit, plants, etc. If you’re looking for something more than what’s available with the software templates, no worries; the software can be used to create custom designs. We’ve even used it to create some designs of our own that are not offered by any other pool company. Click the plus signs (+) to reveal each section and see the entire pool building process from beginning to end. 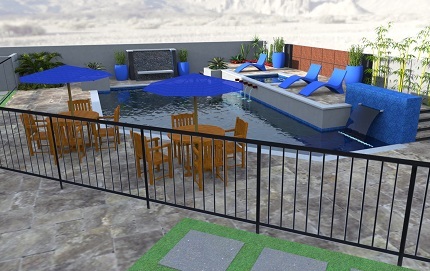 The process starts digitally with pool design. Using the latest software we’ll consult with you to include the features you want in your dream pool. 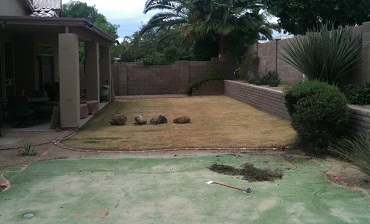 Once the digital design is completed, the crew gets to work to make your dream pool a reality. Once construction is completed, beautiful landscaping provides the finishing touches with the perfect combination of hardscapes and softscapes. 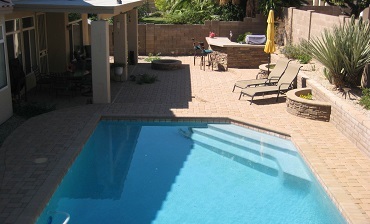 Contact our office in Gilbert to submit a pool design inquiry.